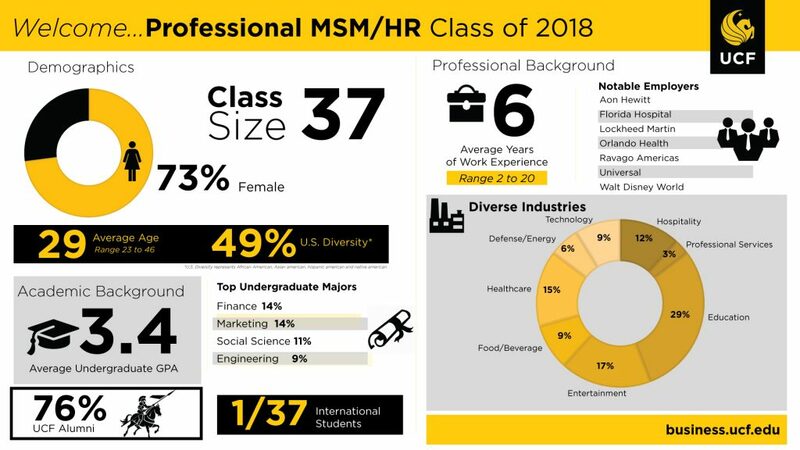 UCF’s Professional Master of Science in Management – Human Resources Track, is a unique program for working professionals who aspire to become leaders in human resource management or general management. Fully-aligned with the SHRM HR Curriculum Guidelines, the program’s curriculum focuses on advanced coursework in management and human resources. The PMSM HR is designed for professionals with human resources experience who seek career advancement in the areas of human resources, strategic planning, organizational effectiveness, staffing, compensation and employee relations. 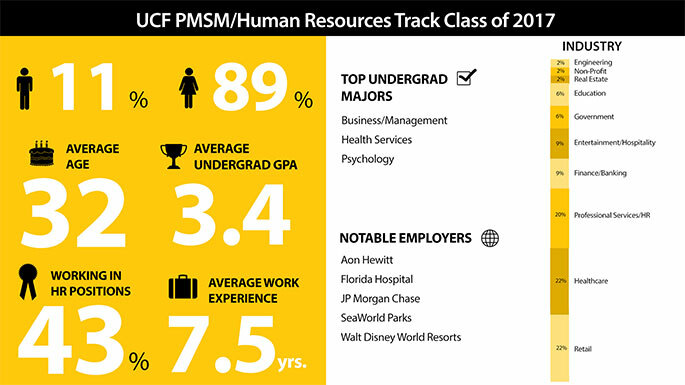 The UCF PMSM/HR track’s innovative curriculum combines general management and strategic business classes with advanced courses in human resources management. Participants gain the latest business techniques and knowledge for success in today’s competitive marketplace. Students learn how to develop practices and methods that align human resources activities with organizational strategies and long-term plans, providing students with the knowledge required to successfully anticipate, plan, and carry out changes. The UCF PMSM/HR is a certified SHRM HR curriculum program. Our curriculum is fully aligned with the SHRM HR Curriculum Guidelines. Students enrolled in the UCF PMSM HR program are eligible to apply for the SHRM Certified Professional (SHRM-CP) exam in their final year of study, and must have a minimum of 500 hours of relevant experience to apply. The UCF PMSM/HR is presented in a cohort format with a limited class size. The cohort experience allows for a diverse group of professionals from a variety of academic and industry backgrounds to enhance their capabilities and broaden their prospective while expanding their professional network. The UCF PMSM/HR track program is a 20 month program/30 credit hour curriculum with classes on Monday and Wednesday evenings, 6:00-9:50 p.m., at the Executive Development Center’s state-of-the-art downtown facility. Included with the UCF PMSM Human Resources program is the Executive Mentoring Program. The program was designed to facilitate the transfer of knowledge and expertise in our community through connecting our graduate business students with UCF alumni and key business influencers to assist with career development and potential realization. The UCF PMSM HR track program is for professionals with human resources experience or human resources-related experience and seek to advance their career in human resources or management. Students with a variety of backgrounds, including those with degrees in business, education, hospitality, nursing, and psychology are encouraged to apply. Minimum requirements include a bachelor’s degree with a 3.0 GPA from an accredited institution and an minimum of two years professional work experience in human resources or related HR experience. The UCF PMSM is a market-rate program with an investment of $30,000 which includes 30 credit hours, laptop computer, parking downtown, and lifetime UCF Alumni membership.